“Stress is your body’s way of responding to any kind of demand or threat. When you sense danger—whether it’s real or imagined—the body’s defenses kick into high gear in a rapid, automatic process known as the “fight-or-flight” reaction or the “stress response“. Ablation, a resolution created for certain dysrhythmias. Ablation is used to treat abnormal heart rhythms, or arrhythmias. The type of arrhythmia and the presence of other heart disease will determine whether ablation can be performed surgically or non-surgically. Ablation therapy using radio frequency waves on the heart is used to cure a variety of cardiac arrhythmiae such as supraventricular tachycardia, Wolff–Parkinson–White syndrome (WPW), ventricular tachycardia, and more recently as management of atrial fibrillation (especially when its newly diagnosed when medical management can’t change it back to normal sinus rhythm, which is the normal cardiac rhythm seen on a telemetry monitor or of an EKG taken on a patient). An arrhythmia is a change in the heart’s normal rate or rhythm, normally between 60 and 100 beats per minute. Arrhythmias are classified by their location in the heart and by their speed or rhythm. An atrial arrhythmia is an abnormality that occurs in one of the two upper chambers of the heart, the left or right atrium. Arrhythmias are associated with aging and typically happen more frequently during middle age. At least 10 to 15 percent of people older than 70 years experience arrhythmias. We have what we call our human pacemaker of the heart that naturally sends conduction for the heart to pump, which is called the sinus node. This is in the upper left corner of the right chamber of the heart. That is where the name sinus rhythm derives from (the sinus node) which is the best rhythm a human can be in as long as the pulse rate stays above 60 and stays under 100. Now if that sinus node for some reason breaks down and no longer works; so than the pace site starts somewhere in the right atrium below the sinus node (the heart is compensating for whatever is the reason the sinus node is not working). So now the rhythms are called atrial rhythms because of where the new natural pacemaker site is in the heart. This is where ablation comes into play if the type of atrial rhythm they have is detrimental to the patient; including if that patient is a candidate for this procedure. Between our heart chambers on the top (called atriums) and below (called the ventricles) is a AV (meaning atrioventricular valve). Rhythms above the ventricles are also grouped as supraventricular rhythms. 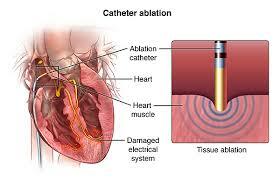 Which is what ablation is used for. Atrial fibrillation. The electrical signal that circles uncoordinated through the muscles of the atria (the upper chambers of the heart), causing them to quiver (sometimes more than 400 times per minute) without contracting. The ventricles (the lower chambers of the heart) do not receive regular impulses and contract out of rhythm, and the heartbeat becomes uncontrolled and irregular. It is the most common atrial arrhythmia, and 85 percent of people who experience it are older than 65 years. Atrial fibrillation can cause a blood clot to form, which can enter the bloodstream and trigger a stroke. Underlying heart disease or hypertension increases the risk of stroke from atrial fibrillation as does age even without heart disease or hypertension. Premature atrial contraction (PAC or premature atrial impulses). A common and benign arrhythmia, a PAC is a heartbeat that originates away from the sinus node, which sends electrical signals through the upper chamber. It typically occurs after the sinus node has initiated one heartbeat and before the next regular sinus discharge. A PAC can cause a feeling of a skipped heartbeat. Use of caffeine, tobacco, and/or alcohol, or stress can bring on PACs or increase their frequency. Supraventricular tachycardia (SVT). Characterized by a rapid heart rate that ranges between 100 and 240 beats per minute, SVT usually begins and ends suddenly. SVT occurs when an electrical impulse ‘re-enters’ the atrial muscles. A disorder that a person may have at birth, SVT is commonly caused by a variation in the electrical system of the heart. SVT often begins in childhood or adolescence and can be triggered by exercise, alcohol, or caffeine. SVT is rarely dangerous, but can cause a drop in blood pressure, causing lightheadedness or near-fainting episodes, and, rarely, fainting episodes. Atrial flutter. Differentiated from atrial fibrillation by its coordinated, regular pattern, atrial flutter is a coordinated rapid beating of the atria. Most who experience atrial flutter are 60 years and older and have some heart disorder, such as heart valve problems or a thickening of the heart muscle. Atrial flutter is classified into two types, according to the pathways responsible for it. Type I normally causes the heart rate to increase to and remain at 150 beats per minute. Rarely, the rate may reach 300 beats per minute; sometimes it decreases to 75 beats per minute. Type II increases the atrial rate faster, so the ventricular rate may be 160 to 170 beats per minute. As with atrial fibrillation, atrial flutter increases the risk of stroke. Diseases of the atrial muscle. Sinus bradycardia. Associated with impaired impulse generation in the SA node, it causes the heart rate to decrease to fewer than 60 beats per minute. Commonly caused by SSS, drugs like beta-blockers and calcium-channel blockers can also cause sinus bradycardia. Occasionally sinus bradycardia can be caused by impaired conduction of impulses to the atrial muscles. Wolff-Parkinson-White syndrome (WPW). WPW syndrome occurs when electrical signals fail to pause in the atrioventricular node because an extra pathway allows the impulse to “bypass” the normal pathway; and the syndrome is sometimes called bypass tract. 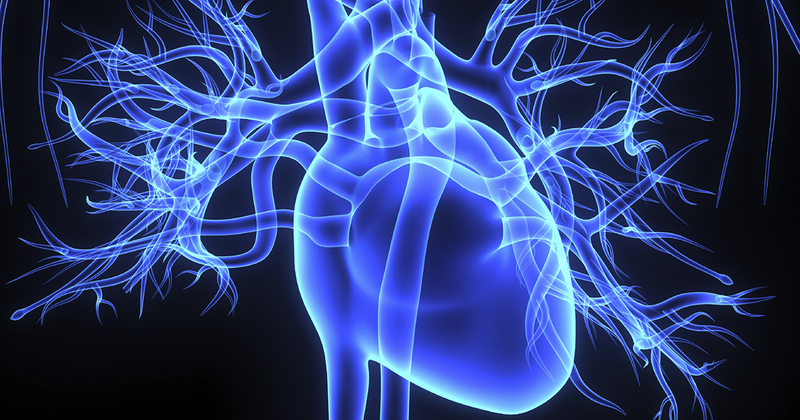 WPW syndrome causes heart rates approaching 240 beats per minute. Occasionally, impulses can go down one extra pathway and up another, creating a “loop” or “short circuit,” (called SVT because of WPW). Patients with WPW syndrome may develop atrial fibrillation and are at increased risk for developing a dangerous ventricular arrhythmia when this occurs. Disorders of impulse generation – A signal that generates part of the heart’s electrical system other than the SA node. Disorders of impulse conduction – “block” the heart’s electrical impulse and prevent it from traveling its normal pathway. Heart attack – causes scarring of the heart, which can interrupt electrical impulses. Some prescription medications (certain heart drugs and certain cold, cough, allergy medications and anti-depressants). The onset and duration of arrhythmia symptoms vary according to its type, frequency, duration, and whether structural heart disease is present. Certain arrhythmias may cause fainting, and, occasionally stroke, while others (‘silent’ arrhythmias) cause no symptoms.